The startup hopes to provide its floating wind-power platforms for a 150-megawatt offshore wind project led by Portuguese utility EDP. Principle Power has joined a consortium to develop a 150-megawatt offshore wind project with Portugal's EDP Group, president Jonathan Bonanno said at the Dow Jones Alternative Energy conference in Redwood City, Calif. on Tuesday. The group, led by EDP, responded to a request for deepwater offshore-wind proposals and submitted an application for a grant from the European Commission. The companies expect to find out whether they will receive the grant money early next year, Bonanno said. "It's a competitive process," he said. "Fingers crossed that it gets done, and even if it doesn't, I'm guardedly positive about the prospect of going forward even without it. We've talked to people that have committed to the proposal, and they're all very excited about what we're talking about. They are ready to consider what the next steps are. So I'm hopeful." Principle Power is commercializing floating wind-power platforms that use heave plates to counter the rise and fall of the waves so that they remain stable. The technology, which Principle has exclusively licensed from Marine Innovation & Technology, is called WindFloat. In a recent test, the WindFloat survived a 100-year wave regime, Bonanno said, adding that it is ready to be put into its first pilot projects now. The EDP project would begin at a pilot size of 5 megawatts – or one 5-megawatt turbine on a floating platforms – and then grow to the full 150 megawatts. "The whole thing is very jumbo-sized," Bonanno said. "It's a lot of work. But the environment is absolutely right." He said the expected cost of the project hasn't yet been determined, but said full-fledged plants are "absolutely" going to be in the billions. 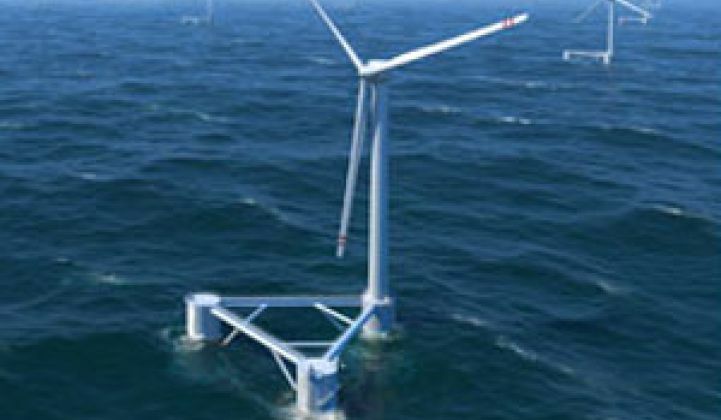 The company earlier this month told Greentech Media that it has signed an agreement with the Tillamook Intergovernmental Development Agency to develop a 150-megawatt offshore wind power plant off the Tillamook County coast in Oregon (see Blowing Offshore Power Into Oregon). That project is now expected to be the company's second, after the one with EDP, Bonanno said. Principle Power also is considering Maine for its third pilot project. "The locations where we're producing this energy is so critical," he said, adding that the company also has been looking at the east coast of Japan. Japan has so little available land that building new power plants on it "is really not an option," he said. "You have to go offshore," he said. "And the [east coast] is a huge resource, but drops directly into the Pacific Ocean, so you have to float; you don't have other options. Founded about a year ago, Principle hopes to sell 90 wind floats by its seventh year, Bonanno added. The company is still working on raising a $20 million round of equity funding, as Bonanno told Greentech Media earlier this month, and still plans to close the round in the fourth quarter of this year or the first quarter of next year. The company hopes to exit in six to seven years through a strategic or public offering, he said.